Advance Tabco TTR-4D Stainless Steel Tubular Tray Slide with Drop-Down Brackets - 62 3/8" x 10"
Advance Tabco TTR-4 Stainless Steel Tubular Tray Slide with Fixed Brackets - 62 3/8" x 10"
Advance Tabco TTS-4D Stainless Steel Solid Tray Slide with Drop-Down Brackets - 62 3/8" x 10"
Advance Tabco TTS-4 Stainless Steel Solid Flat Tray Slide with Fixed Brackets - 62 3/8 x 10"
Advance Tabco TCB-4 Cutting Board - 62 3/8" x 8"
Advance Tabco TDS-4 Dish Shelf - 62 3/8" x 7"
Boost your buffet presentation and style with the versatile Advance Tabco B4-STU-B Everyday Buffet solid top table with enclosed base. This unit is ideal for offering fruit or dry cereal at your breakfast buffet, displaying non-refrigerated desserts such as cookies or cupcakes in your college cafeteria, or even holding flatware, plates, and napkins! 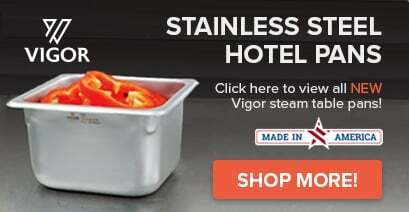 In addition to a solid 20 gauge, 304 series stainless steel welded frame top, this unit features four 4'' swivel casters, and two with brakes, for effortless transport from one destination to the next. 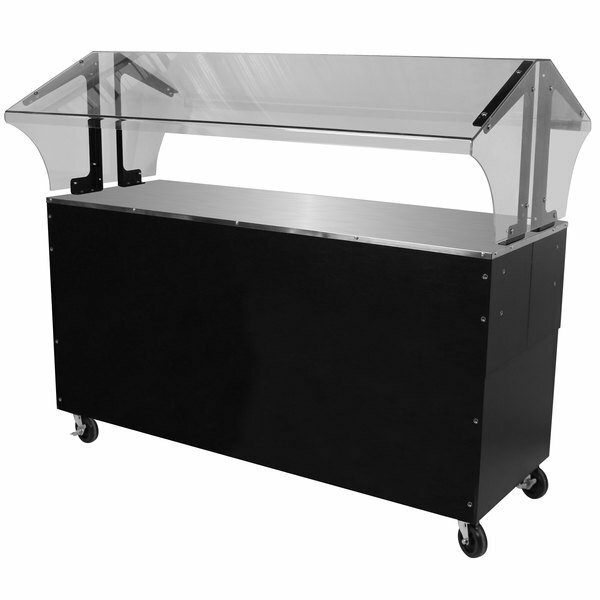 A double sided 1/4'' thermoplastic polymer sneeze guard and integrated side panels serve to protect your food items from airborne bacteria, while the unit's body boasts durable steel construction with a matte black vinyl finish. Each feature allows users the opportunity to stage a sleek, professional buffet in multiple locations for any number of guests or customers. The Advance Tabco B4-STU-B is perfect for college dining halls, buffet-style meals, school lunches, and more.